Home>PET PRODUCTS>Cats > WP Rocky Mountain High catnip- Made in USA 3 left! Rocky Mountain High is certified legal and more fun than a barrel of monkeys! 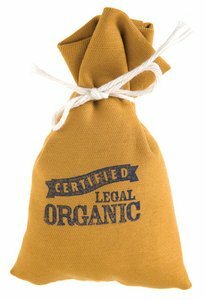 A heaping sack of 100% premium USDA certified organic catnip is wrapped in an organic cotton sack and tied with a reclaimed cotton string. The top is not completely sealed, so bits of nip will tease and please the most aloof of cats as it slowly sprinkles it’s way out of the bag. Watch your cat attack, bat, and even snuggle their own little sack of catnip. This is the most Eco Friendly cat toy we offer.